Batman Returns is a side scroller beat em up that was developed and published by Konami in 1992. Most popular consoles at the time had a version of Batman Returns released for it but to my knowledge the SNES version was unique from all the others. 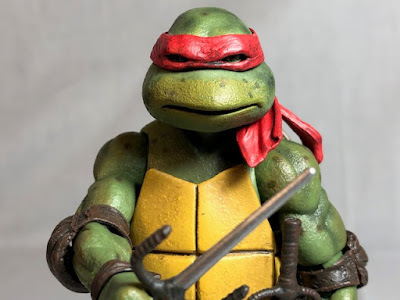 How does this game compare to the classic SNES beat em up Turtles In Time which was also developed by Konami?? 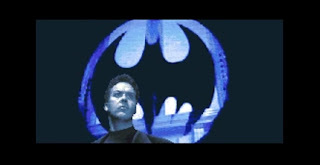 This game has you play as Batman in seven different levels, each with two to three parts, that folllows the movie nicely. 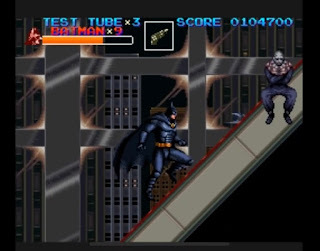 The levels takes place at a farther along scene than the last and I only mention this because some games don't always follow the movies they were made after. 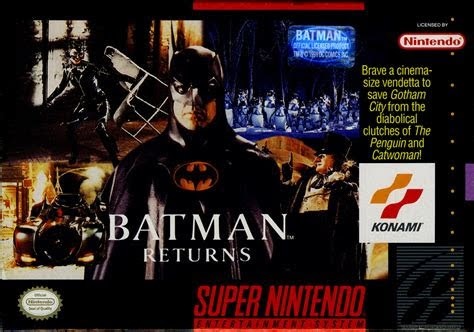 Konami made this game and as I mentioned earlier they've had some success with side scrollers and generally, at least back then, had a reputation of making great games and Batman Returns is no different. Batman Returns lets you unleash all kinds of 16-Bit Batman attacks against the bad guys. You get a punch button, a kick button, a grapple button. All these moves can be combined to with each other for a stronger attack. 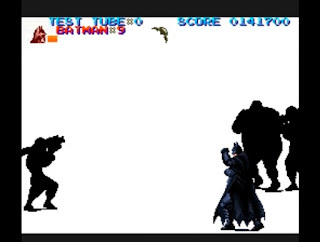 Batman can also do special moves including cape sweaps, head butting, and a building slam. I love these guys with the big skull heads on the motorcycles. Ask you make your way throught the game you'll find health, extra lives, and test tubes. I like the test tubes, when you use one it kills all bad guys on the screen which can be very helpful at times. I would occasionallly use them when fighting a lot of bad guys but I mainly would save them to use during boss battles. You also earn an extra life everytime you earn 100,000 points. 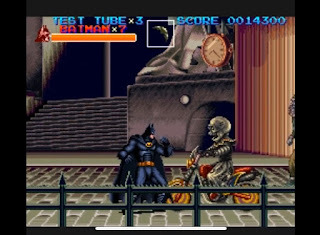 Most of the levels are the typical side scrolling where you have to fight a number of bad guys and after killing them all the game allows you to continue scrolling right. There are also a couple of levels where you are climbing buildings and moving up. 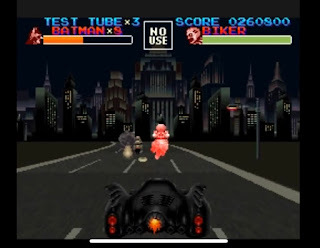 Finally the game has a Batmobile level where you get to drive the Batmobile and shoot "Batdiscs" at the bad guys vehicles. Between each level are some great 16-bit cut scenes from the movie. 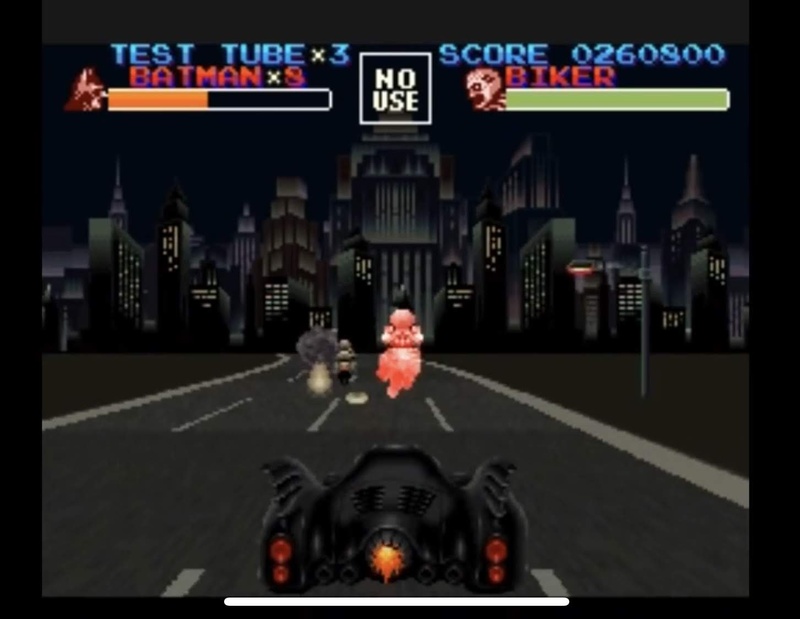 Of course they aren't video directly from the movie but they have enough bits to look pretty good for a console in 1992. 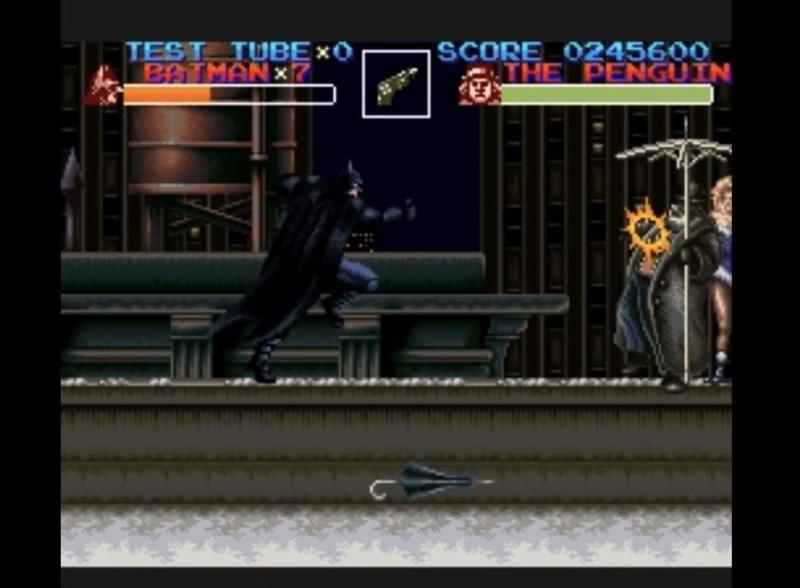 Boss fights are fun as you get to beat up Catwoman and the Penguin. There are other bosses but these two are the best. In the end this is a great side scroller by Konami, not as good as Turtles In Time but still an enjoyable game. There are multiple difficulties so you can tailor the difficulty to your skills. 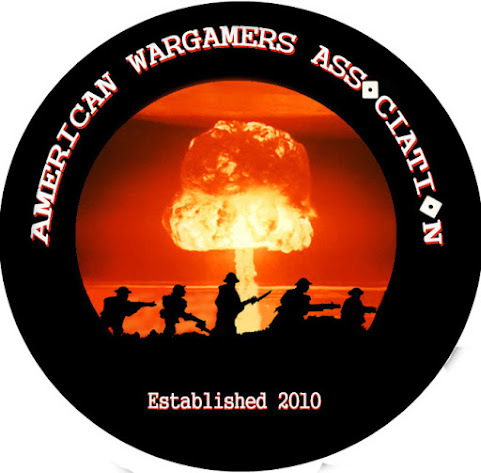 If you have the oppertunity to play this game I recommend you try it out. 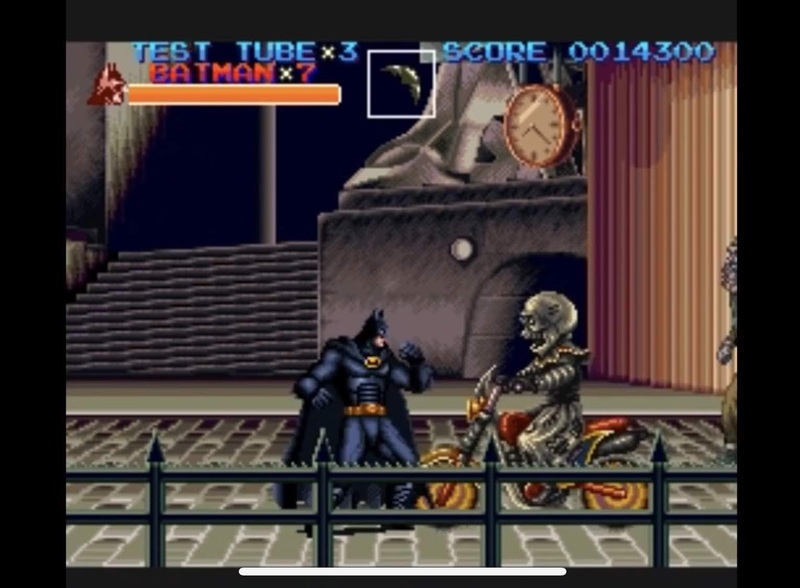 I give Batman Returns for the Super Nintendo an 8 out of 10.